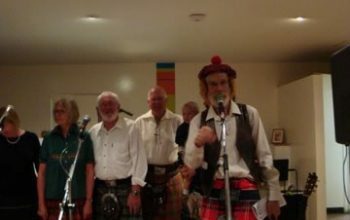 In order to help pay for the Top Half Festivals held at Glen Helen every second year, a small group of intrepid local “folkies” decided to run a fundraiser in November 2008. to celebrate the birthday of St. Andrew patron saint of Scotland. This took the form of a dinner coupled with local artists performing during the evening. 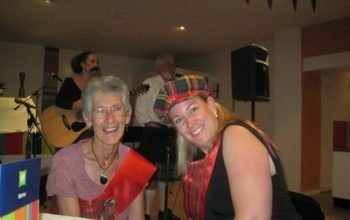 With a local Piper, haggis on the menu, guests in kilts, a sword dance, and music fun and frivolity how could you fail? 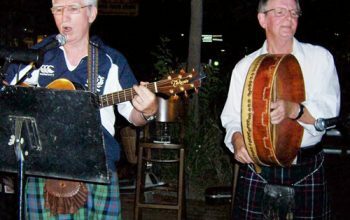 With over 100 people attending and with the added extras of raffles and an auction, the evening proved a roaring success and the Folk Club coffers were suitably swelled. 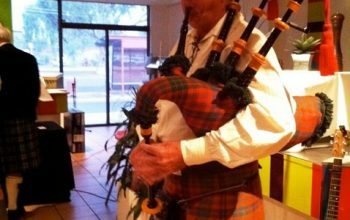 This particular event has now become a permanent fixture on the Alice Springs Folk calendar and has proved a great way to raise funds.